This code list will help you program your old or new universal remote to operate your air conditioner. If you have lost your air conditioner remote and bought a universal AC remote, the codes we have listed will work with your brand of air conditioner. Airwell, Arena, Arlec, Aussie Air, Aux, Blueway, Carrier, Celestial, Changhong, Chigo, Cooline, Conia, Daewoo, Daikin, DEC, Dèlonghi, Derby, Electra, Electrolux, Emailair, Fujita, Fujitsu, Goldstar, Gree, Haier, Heller, Hisense, Hitachi, Hotpoint, Hyundai, Kelon, Kelvinator, Levante, LG, McQuay, Midea, Misakae, Mistral, Mitsubishi, NEC, Omni, Omega, Panasonic / National, Polo Cool, PYE, Samsung, Sanyo, Sharp, TCL, Teco, Toshiba, Trane, Uni-Air, Whirlpool, Winia, Yconon, and York AC Brands. 1 – Point the remote at the AC. 3 – Try the codes for your AC brand and one will work with your AC. 4 – Test all functions of the AC to be sure it works. 5 – If all functions are not working then repeat the above process with a different code. 2 – Press the “SET” button for 5 seconds and it will begin to find the codes automatically. 3 – Your device will beep when it finds the correct AC code. 4 – Press any key on the remote to stop the search and store the AC code. 5 – Test all functions of the AC to be sure it works. 6 – If all functions are not working then repeat the above process. NOTE: Some AC units use RF remotes and others use IR remotes. AC brand not listed? Let us know the brand of your Air Conditioner in the comments below and we will find you the codes to operate your AC. We can help whether you need 2, 3, 4, or 5 digit codes. If your brand of AC is not listed, let us know and we will add it to the list. I have a split system 24 btu GENAIRE air conditioner and require the code for a universal remote. Thank you for your assistance. I need the remote code for a Boston Bay Citihardware 2 Hp mini split inverter aircon. Hi, I am in need of the 4 digit code for a Daijitsu air conditioner. We purchased a universal remote. My AC brand is Breeze model PN-12/I. Can’t find anything with google, possibly OEM Gree. I have some 500 in 1 universal remote, but least autosearch from 0..500 does not produce any match, nor trying 0, 20-39, 309-316 and 482 manually. Inside the unit there is sticker which reads 30540016 MBF523B NOR1612100187 AB 120501 I think this is product codes for the computer unit. Can you please include codes for Lennox mini split AC. Have a YMGI Model# WMMS-24E-V2B(57)3 and don’t see that brand with codes on any of your lists. Could you please help find them? We have a KeyOne KT-E03 universal remote. When it searches the display shows 4 digits so I’m assuming it will need a 4 digit code. What is Genaire air conditioner remote code? I need code for PEL split ac 1.5 tons. I am looking for code of a/c of airco for use with universal remote…please help…!!! Needs codes, discrete would be awesome, for a SPT 14k btu portable ac unit. I need the codes for AKAI XS AS-AC925XB Air Conditioner, please. I have tried with several brands’ codes in different apps but nothing works. Can i ask what code do i need to type on the universal remote control for MASELINO brand of air condition. I have a lorenz xls-09hk air condition and a universal a/c remote k-1000 and I still can’t find the correct code .Please reply.Thank you in advance. I need the codes for Telstar and Super General Air Conditioners please. I have tried with several brands’ codes in different apps but nothing works. So after searching for GE and General Electric air conditioner I finally figured out ge uses gree codes. So it will use 000, or 020-039. My GE unit specifically used 026. It’s a standard window Ac unit. I lost my remote control, I have a Boston Innovative Products A/C mobile unit… Model MOB-10KDCHR and I need a remote control for it.. and codes to set it up… Can you help me with the search codes to set up the universal remote? Really need help for ac remote code. My currently Fujiaire remote ZH/JT-03 is not working. Just bought the Chunghop universal remote but fujiaire is not in the list. Hello sir..really need help for ac remote code. Curently using Fujiaire remote ZH/JT-03. I need a code for akira air conditioning. I have Sea-C universal remote, can’t use the codes above for my Changhong remote control. Lost our remote, Zamil Classic Split-type AC, wall-mounted indoor unit, please find out the code, thank you. I need codes for an Ayomi air conditioner. Any codes for Nova florida / Fondital units? Does anyone have any code for skytec? Hi am looking for a code for Stork refac unit? I have a Genaire air conditioner that I have lost the remote for. I bought a Digitech AR1731 Universal A/C remote for it, but there is no Genaire code. Do you know if this remote will work with a ‘secret’ Genaire code? Do you know any codes that might spring my Genaire to life? We do not have a Genaire air conditioner remote code in our database. We would recommend to use your phone either iPhone or Android and get an app that can control your Genaire air conditioner. Here is a link to Android Air Conditioner Apps. Here is a link to Apple Apps to control an Air Conditioner. Have you emailed the Digitech AR1731 Universal A/C remote company to see if they have a file on remote codes for Genaire air conditioners? Could you please add codes for the PRIMA brand split AC? I am looking for a replacement remote for TOVLUX MS-18. I think it was built by AUX Electronics and from China. I need remote code for a Tristar kfr-36gw/a2 Air Conditioner. 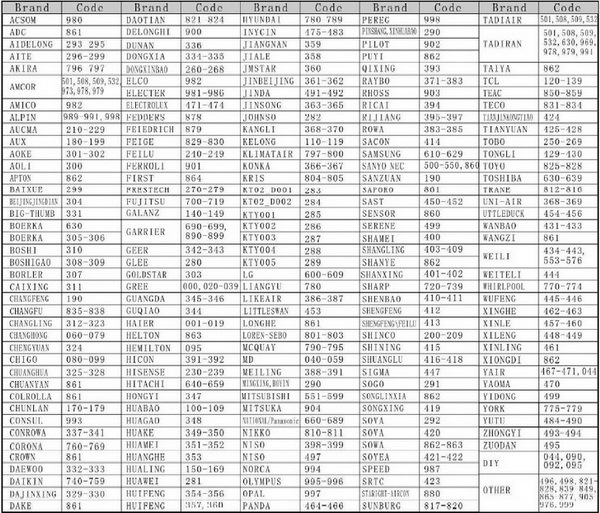 Check this page and find the model number for your Tristar AC and the PDF manual will show you remote codes. Here is the Tristar AC webpage PDF files. I need the remote code for a Delonghi One Inverter Split AC. I have tried 0232, 0482 and 900. Try the remote codes without the zero…. use 232 or 482 for your Delonghi One Inverter Split AC. If that does not work you may want to try a universal remote that is programmed for most Split Air Conditioners. Need the code for Fidji Electric Air conditioner as my original remote control does not work. Need the remote control code for ComfortStar plus AC. The brand is not on the list. The remote control code for ComfortStar plus AC is 35 or 78.
i need a code for my SKYTEC air conditioner! FRIGIDAIRE A/C Remote Code? Anybody know of their codes? Thank You! I have a YORK A/C MODEL HLCA12FSAD-4 that uses a/c remote control model R51/CBGE THAT IS NOT WORKING. Please advice which universal control works with the above unit. 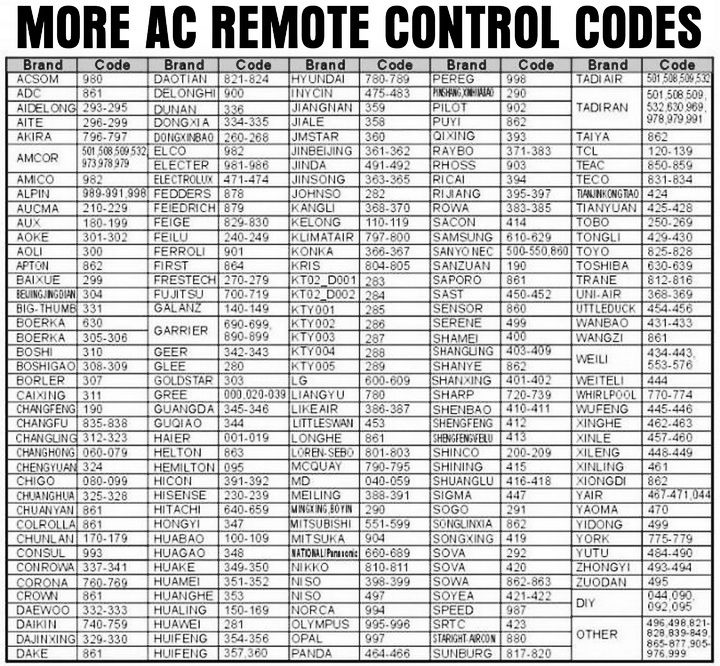 Do you have the remote codes for a TGM Air Conditioner? Thank you! I lost the remote for Fuji Electric A/C split unit. I didn’t see the remote code for the Westinghouse Air Conditioner brand. I can’t find it anywhere in the internet. Try the Westinghouse AC remote code 395 and it should work. Check this page and the other pages in the Westinghouse AC manual. I bought the 1000 and 1 Universal remote control to use with a Pensonic Air Conditioner. Would you have the codes? I bought the 1000 and 1 Universal remote control to use with a Starwin Comfort Air Conditioner. Would you have codes? I need a code for a Mitsui Air Conditioner. I need the Remote code for Yonan split AC. Thank you. I need the code(s) for a universal remote control for a TEMPSTAR air conditioner. I searched and this brand is not listed on universal remote control that I bought, which has the brand as UNIVERSAL, and I can’t find it anywhere on the internet. Hi did u ever get the code for the tempstar. I looking for it right now and can’t find it anywhere. I have several Westpoint Eolia Air-conditioner units and the universal remotes are the KT-e08 remote. Please supply me with a code to program the remote as the Westpoint 0088 code does not work. Also i have had the remote on “search” option for the past 4 hours but does not seem to find the correct code. I have also tried this with 7 remotes as i am planning to replace 17 remote units. I have a Best AC unit MODEL NUMBER KFR-35GW/GX1b. We don’t have a remote for them. Can you help us find the code, we bought a universal remote. My aircond brand is Midea model MSK-09CR, what is the code for universal remote control either for type mastro KT-TS08 or R06/BGCE? HI, I own a Fuji Electric RSB09LDC. Which codes should I use? I lost remote control for my Fuji Electric A/C model RSA24SET. My Air Conditioner brand is an Excel mini split. I need a remote control for it. Try the highly rated Universal AC Remote Control made by SDBER. My AC is a Westpoint. My remote is an AC remote universal d 1000. For a Westpoint AC try the remote control code 88. Any codes that will work on a 2007 b&q portable air conditioner wap-021ec? Do you have the code for Climaveneta A/c? What is the remote code for a Tropigas Air Conditioner? Please tell us the model number of your Tropigas Air Conditioner and where it was made. Need a Super national (mr chill) universal remote code. I lost my remote control for a Windair 15seer12mbh 6322997125 or 63229971286. I purchased a universal remote bus does not have a code. I need a code for an Air Max. i need codes for a cool breeze airco. Tell me Supra AC code? I am using g.e aee12kb and lost the remote, help me look for the code please? TIA! I have a Arctic AIr (Aust) Pty Ltd brand unit. Do you have the codes for this one? Also which remote do I buy? I Have an International Comfort A/C model # MC009KD no longer in production. Purchased LG universal remote 6711A20010D. However cannot find a code # in order to connect the AC. My ac model is Voltas 122 LYe 1 ton window. Please send me the codes. Does anyone know a code for a Dunham-Bush heat pump/ AC unit? Help! I have Westpoint EOlia AC unit. Can you help me with the universal remote code? For a Westpoint EOlia AC unit = Use the remote code 88. I need the code for a Whisper Aire Elite AC unit. Lost the remote of LLoyd split ac 1 ton model number FLS13A3C. Please share the code number and suggest way forward. I try to find the codes for Toshiba Air Conditioner remote control WC-K1UE. HELP! Does anyone have a code for a Dunham-Bush heat pump/ AC unit? I have a universal remote and it won’t turn off the heat pump anymore, I tried doing the Auto Find but it didn’t find anything… Help me! Thanks! Can you send me the remote code for it? 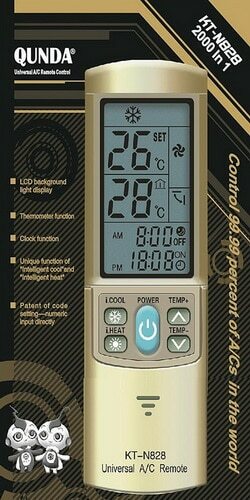 Dynamic Air Conditioner remote control code is 167. I need the remote code for an Admiral air conditioner. Try looking through the Admiral AC User’s Manual as we do not have any remote codes in the database. Can i know universal remote code for singer airconditioner? What is the code for TOPAIRE aircond using univeesal remote control K-1068E? I am looking for the universal code for an Elegance air conditioner. The universal remote worked and now its not working anymore, and i dont have the manual. I have a Hisuper Aircon and my remote is broken. I got a universal remote and I don’t have the code for the remote, it is a 3 digit code. Do you have TOTALINE 1.5ton split Air Conditioner REMOTE CODES? Here is a TOTALINE AC Manual, at the bottom it contains info on remote codes and programming them. Are you still using the original remote that came with your AC unit or are you using a universal remote for your AC unit? If nothing works, buy a well known brand universal AC remote control that works with TOTALINE AC units. Wat is the code for comfort star? What is the remote code for a DAYA air conditioner? Could you please help me with the remote code for a Climaveneta a/c unit. Serial number is12109 S04 P10277 Model/Type Number is HIP 140. Need codes for In Time split type wall mounted air conditioner. Try using the remote code 2010. I have a Innovair Vexus. Anyone have a code for me? I have a lennox air conditioner. What are the codes for that? Need the codes for a Sankey air conditioner. 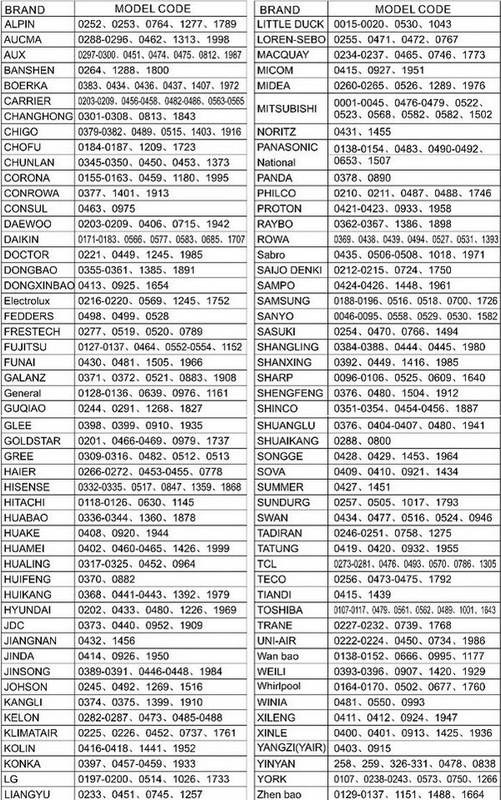 Try these remote codes for your Sankey AC 0384-0388, 0444, 0445, 3969. Can you see if there is a 4 digit code for a TRILEC KFR-25G? I have MAXA air conditioner. What´s the corresponding remote code for this model of universal remote? The brand name of my airconditioner is Emilee. Kindly furnish me with the codes. Do you have the remote code for Vestel AC? Does anyone have the code for a sunair ACS12? I have lost the remote and the touchkeys on the appliance have decided to not work anymore. I am looking at purchasing the AirconOff Smart remote here in Australia, but I cannot find the code for this device listed anywhere. Do you have the code for a Tornado air conditioner? 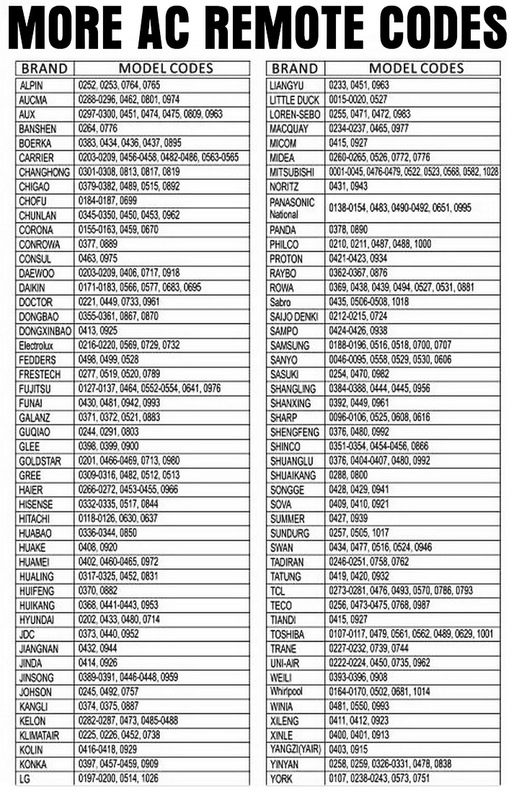 Need Malaysia Electrical Corporation (MEC) air-conditioner codes. Try these Malaysia Electrical Corporation (MEC) air conditioner codes: 194, 232, 233, 278, 280, 281, 282, 283, 285, 286, 287, 302, 303, 304, 305, 307, 314, 320, or 113. Looking for an Universal Remote that will work with a Harbor Point split ductless A/C model: HS-26H1A-M88AH1. The number on the existing remote is ZHF/JT-03. Code for Fujiaire model FWC184A1-A1NA. Using chunghop universal remote K-1028E. I have two JBC brand split systems that don’t respond to the remote any longer. Could you help me with the codes? GHSS0010 and GHSS0012 are the model numbers. 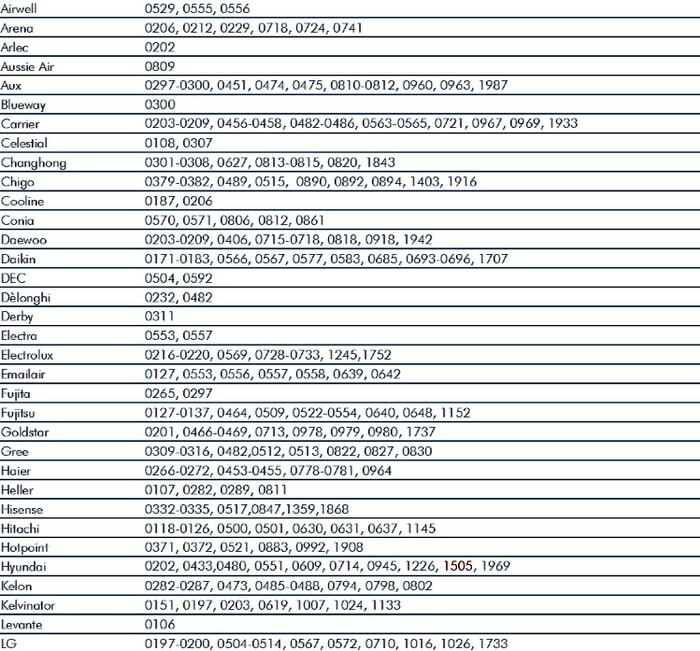 I am looking for code for Klimaire Air Conditioner… I don’t see it on the list. There are no AC codes for Klimaire Air Conditioners in our database, try checking the Remote Control Reprogramming and explanation Manual for Klimaire AC. Do you have the code for a HUKE Air Conditioner? Just posting this in case it helps anyone else. The remote control of my Eco Aire broke, and I bought the Unitherm KT-518 universal remote. Eco Aire is not a listed brand for this universal remote (it is not on the code list), so I was very pessimistic that it would work and thought I would try to auto search the code. However, as soon as I pressed “power” on the remote, it automatically turned on the Eco Aire and works great. I did not even have to auto search or put any code in. If someone else needs a remote for Eco Aire, this is definitely worth a try! I lost the remote to my Quietside outdoor split system Model QS36-VP220. I need a code for a Starway 12000 Btu Midwall Split AC. I have a KT-e03 and a KT 4000 and a KT 518, but none of them has a code. Please can anyone advice me on any code for Koolsola AC? My air conditioner seems nameless and the only model name i have is TKFR 72 GW. I lost my remote and need to replace it. My a/c is Olefini, I accidentally reset it. Is your Air conditioner remote similar to the one in this PDF Olefini Air Conditioner File? My air conditioner remote control brand is not in the list. My air corn brand is SINGER. Looking for universal remote code for LG Mini Split Air Conditioner 920 RG-10101797-1N2405. The remote codes for the LG Mini Split Air Conditioner are 600, 601, 602, 603, 604, 605, 606, 607, 608, 609. Let us know if these work on your LG Mini Split AC. Please can you help ? I have bought a house with 5 air conditioning units installed and no remotes controls. The model is called Steel Air M8249H/i. Which remote would be suitable? The best Universal Remote for AC units is the QUNDA KT-N828 AC Remote Control. It should work well with the Steel Air AC Units. Remote Control Code for Air Conditioner Spring Argo Sc 45W. Could you please let me know the codes of Westair Air Conditioner (model wsi 122). 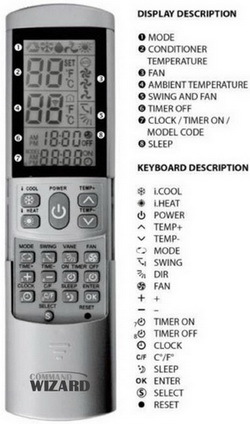 It is not listed in the lists provided by universal a/c remote (model KT-628). I have a Weston AC Air Conditioner the model number is KF-32GW. Help with a code please? Do you have the code for a huke aircon? Need Remote Code for Hyundai Air Conditioner hy12schw. I’ve got a General Electric split room air conditioner and my first problem is that the model doesn’t exists on internet neither on the constructor website. It will be a miracle if you could tell me the code please. I need remote codes for a Telstar air conditioner. Try the remote codes from the numbers 830 through 859 to control your Telstar Air Conditioner. The AC model number is VSW-09A4/EM. I AM USING A UNIVERSAL REMOTE CONTROL. Please can I have the remote code for a VS air conditioner? What is the full model number of your VS Air Conditioner? Which type of remote are you using? I have a GUT GDC014 Air Conditioner and a 1000 in 1 universal remote. But it cannot find the code automatically. The remote for my De luxe air con is broken and I cannot find the make on any list for universal remotes. Can you help. Hello what is the Beko Air conditioner code(or Discrete Remote Control Codes) writing behind of the AC Command “6711A90022N”. And I opened command there is a one chip . Writing ” Q306A LG ıMCRSS046A K8W5TB”. Hi, what is the code for MEC air conditioner? Please help i need code for brand MEC AC. I would need a code for “Miller” AC Air conditioner. 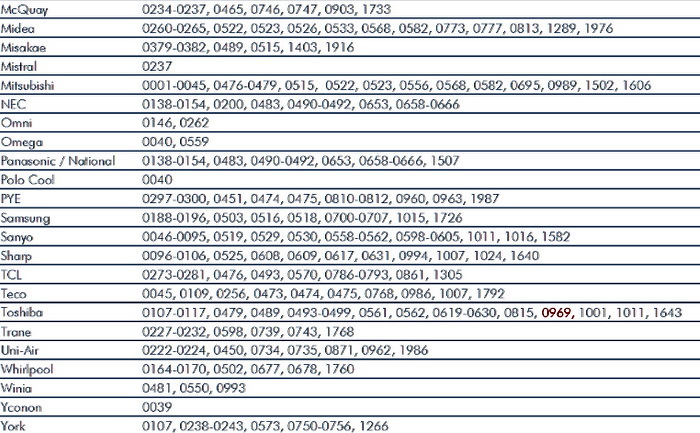 Miller AC Remote Codes = 40, 42, 46, 54, 55, 57, 58. Can I please get the remote code for a Telesonic air conditioner AC? Try the remote codes 40, 46, 48, 54, 471, 24, 380, 434, 423, 188 for your Telesonic AC air conditioner. If that does not work, consider using an Air Conditioning Universal Remote. I have an AC unit brand CLARK Of 24.000 BTU. Which remote code will work on a universal remote control? Please can I get remote code for my AC? Brand is Climaveneta Air Conditioner. Try using the remote code 0572 for Clima Veneta Air Conditioner. yes it worked many thanks and a couple number before also work. Can I have the code for BEKO Air conditioner? Check the BEKO Air Conditioner “Split Room” Owner’s Manual for codes and troubleshooting. What is the code for a Classic air conditioner? The model number is mwhnc09sa. Try using the remote code 46 for your Classic AC model number MWHNC. Thank you so much for the Air Conditioner remote codes! This helped me so much and i will be using it in future times. I can rely on you guys and i am happy to go to your website now, thank you for the codes, again. Please assist with a code for a Eubank Air Conditioner, LEN 10W code. What is the remote code for a Godrej 1.5 ton window AC? My air conditioning unit is Tropicana brand. I need a code for the remote. Can I please get a code for an Innovair Samba AC ductless unit. I’m using a ever well kt-n818 remote control. Carrier AC 53KB-0094 9700 BTUH KB-009-1 CARRIER. The remote has on the inside 402-402-4706. I have tried all the provided Carrier codes from various sources. I have also tried AUTO finding the code. Can anyone provide me with a code to operate the aforementioned A/C? I need the remote control code for my FUJIAIRE MODEL FBS-2411R air conditioner. Try using the remote codes 496, 498, 806, 809. If those AC remote codes do not work, please let us know what type of remote control you are using to control your Fujiaire AC. I need that code too… did u manage get the code to work? shazad??? Just to share. I’m currently using Fujiare Model FBS-1217RV with UA/CR 1000 in 1 OXY-1028E. So far, code 090 works for me. Should anybody has different code/s that also works, perhaps can share. Ty. I bought a KT-e08 air conditioner. I do not have the remote code for TOPAIRE AC. Are you using the remote that came with your TOPAIRE AC or an AC universal remote control? So what is the topaire remote control code? What about remote codes for Comfort-Aire Mini splits? I recently found that AC remotes with the same shape, design and identical controls work on the same frequency. My barber had a remote identical to mine but for another brand of AC. I used it and it worked on mine. My Air Conditioner is Innovair and his is Emerald. I found several sites on Aliexpress and Alibaba that have my remote, however it takes 30 to 60 days to ship. The universal AC remote control I bought does not work. My frequency is 433 from what I have read. My AC remote is identical to REPLACEMENT FUJITA AIR CONDITIONER REMOTE CONTROL – FJASW24023 found in Australia. I need an air conditioning remote control suitable for AUX KT-AX3, KT- AX1, AUX-E1, KT-AX4 FJASW24023 general style. Can someone help me with finding that same one in the US? The AC remote you need (FUJITA AIR CONDITIONER REMOTE CONTROL – FJASW24023) is not located in the USA as we have seen, it is always from China or Australia. You can however try a highly rated Universal AC remote called the KT-N828 AC Remote for 50+ Brands 2000+ Models. It is on Amazon and available NEXT DAY. Can you tell us the universal remote you purchased to use with your Innovair or Emerald AC Unit? I want details about Kenstar AC remote code number from universal remote control. Try these Kenstar Air Conditioner Remote Codes = 0282, 0283, 0287, 0794, 0798, and 0802. If these do not work to control your Kenstar AC, please give us the model number and we can assist further. Tried all codes suggested for a Carrier Split AC. Non worked. Accidently hit #739 and my AC beeped. It now works! Using an AVALY Universal remote but not with their recommended codes. I have purchased a new universal remote for my Samsung split system SH12ZA6/XSA and have tried all supplied codes still not working, do you know the code for this air conditioner? What brand and model number universal remote are you using to control the Samsung Split System AC? I have a GE air conditioner & I don’t see any codes listed for it. Can u help? What is the model number of your GE air conditioner? The brand of our air conditioner is not on the list. We a SWIFT AC. Please help to find the remote code for my SWIFT Air Conditioner. The SWIFT AC remote code will be available if you can provide us with the model number of your SWIFT AC unit. i have a Kosner Air Conditioner and I can’t find the remote code anywhere… can you help me please? For Kosner AC Unit Remote Control Codes try 0397, 0457, 0317, and 0909. If these Kosner Air conditioner remote codes do not control your AC, please let us know the model number of your Kosner AC unit and we can provide further AC remote codes. Can you please tell us the universal remote control model number you are going to use with your Innovair Oasis AC? Once we have the RC model number we can give you the correct remote codes as this unit does not provide us with any remote codes. Here is the troubleshooting and remote guides for AC Innovair Oasis Mini Splits. I have lost remote control for my Voltas split 1.5 tone Air Conditioner. Cannot find code for ac remote. Please help. If you are needing a new Voltas AC Remote, here are many of them on Amazon INDIA. Voltas AC Remote Controls. If you need a remote code for the Voltas AC you can try using the APP that is explained here, Voltas APP Manual. Did you misplace the remote and now you need an air conditioner remote code for your Innovator AC unit? Which part of the AC is controlled by remote, the Innovator part or the Sahara part? Have you tried using a universal AC remote that will actually FIND your remote code for your and program the AC automatically? Are you having other difficulties? Let us know as the model number you supplied us has NO matches. Yes I placed the remote in the washing machine by mistake. The indoor unit has the logo Multizone Trademark then Sahara below it, The same info is on the remote control. I just opened the remote control and it has the numbers 090906T3823 stamped across the circuit board. The remote is shaped like an elongated teardrop. I bought a universal remote by smart electric #CUR5000C. This remote works with two other units by Innovair that I have but not with the one in question. The other air-conditions is also by innovator but with the brand Vexus stamped below the Innovair name. There are no other problems except that I cannot control the AC. I can manually turn it on but cannot adjust the temp and louvers etc. The model number which I submitted was located on the side on the indoor unit. It is a product of Innovair made in the PRC, production date 2009.09.10. Model # modMS18C2DC3 SERIAL NO A81416070900067. Would you like us to direct you to buying a new AC remote control? If you put the Air conditioner remote in the washer by accident, then we assume you need a new remote as giving you remote codes may be worthless. Does this universal AC remote look similar to your old one? Send us a pic at (sahtiek @ gmail.com) with the heading AC REMOTE. I lost my remote control and the Air Conditioner brand is D-LET. Can you help me with the search coeds to set up the universal remote? Try the codes for Air Conditioner brand D-LET = 530, 640, 9080, 4580, 1700, 150, 9000, 4500. Is D-LET the actual name of your AC? Please give us the model number to assist you further. Looking for the Universal remote code Mini split unit Brand TGM. 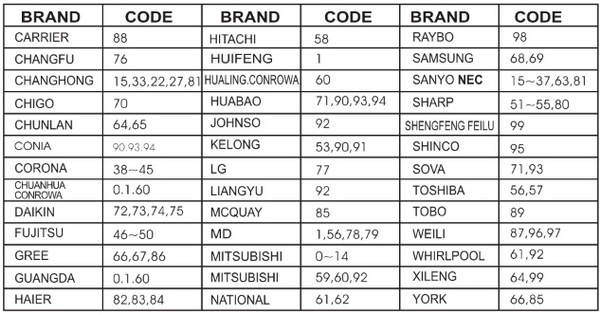 The remote codes that will work with your Mini Split TGM Air Conditioner is = 0309-0316, 0482, 0512, 0513. If those air conditioner remote codes do not work, let us know the model number on your TGM AC and we will assist you further. I have lost my remote control for my Mitsubishi AC. It came with a remote control but I lost it. Now I have to control my air conditioner by using the controls on the air Conditioner itself. Do you know which ac universal remote would work and which code I need to make the remote work with the Mitsubishi AC? 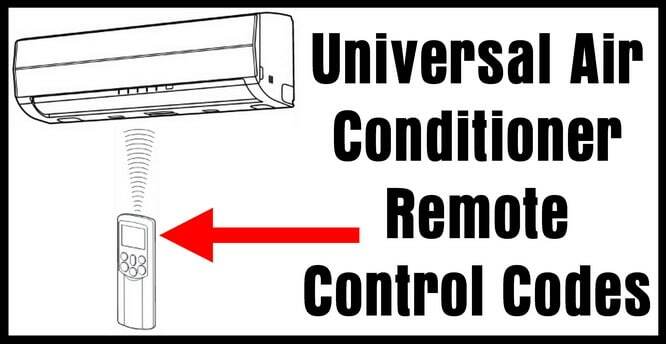 If you lost your remote control for your Mitsubishi AC unit, you can purchase an Air Conditioner Universal Remote online or at any home improvement store. Once you have your new replacement universal remote, the remote codes for your Mitsubishi Air Conditioner Codes will be = 0515, 0522, 0523, 0556, 0568, 0582, 0695, 0989, 1502, 1606. Some AC universal remotes will be able to AUTO FIND the code. You can also buy a the exact replacement remote by using the model number of your Mitsubishi AC unit. Thaty way you will not have to program anything and you will have your original remote.